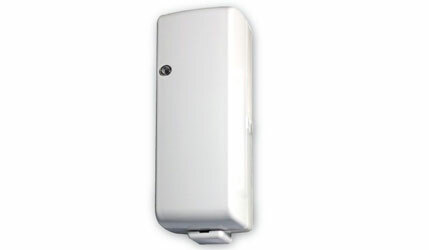 The Axis Wireless Input Module allows supervision of an external device providing on/off status information to the control panel via an AV wireless translator module. Each module is intended to interface between a control panel and normally open contact devices. The connection between the module and the external device is supervised with the aid of an end of line resistor. Each device is powered using low cost lithium batteries. Both primary and secondary batteries are continuously monitored for low battery condition which is indicated by an internal LED as well as a fault condition being displayed at the translator module and the fire control panel. Each module will automatically adjust its frequency and manage its power radiation in accordance with the signal quality received from the Axis wireless translator module. Bi-directional communications with the wireless translator is based on a proven protocol and wireless technology and is fast, reliable and provides the highest level of security. The wireless communications operates on the European recommended frequency of 868 MHz and conforms to the European Standard EN54-25.